It’s funny how different aspects of your life serendipitously cross from time to time. Following my presentation at Leadership Calgary earlier this month about the current state and possible future of western democratic government (in LC speak it was titled “how do we build a systemically and systematically adaptive democratic government?”) we find a British Labour Party getting trounced from office primarily because of an expenses scandal, the Canadian parliment mired in public confusion as to why they would not want to let the Auditor General review MP expenses, and closer to home, the City of Calgary’s auditor says the procurement process is so murky and devoid of rules that fraud has almost certainly taken place. What do all of these have in common? A lack of respect for the role the public plays in democratic government. 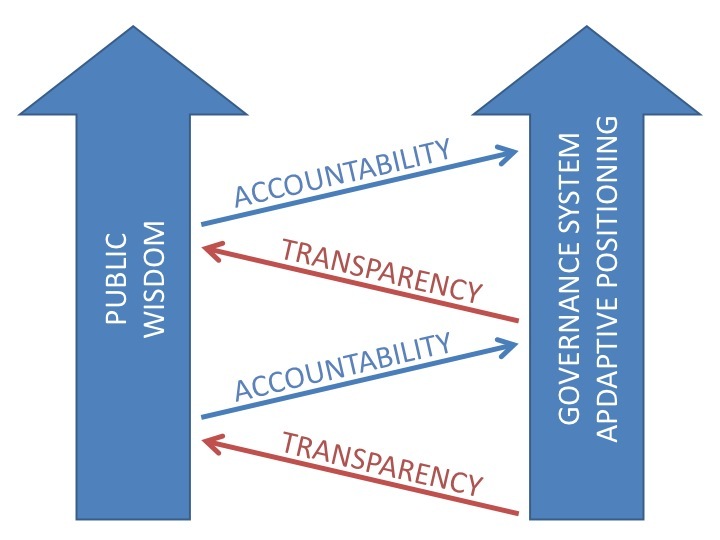 I won’t bore you with the details – I’ll save those for another post or for the Cities and Towns in Transition conference on June 4 and 5, which I have been asked to speak about this topic at – but at the end of the day public wisdom and government adaptability must grow together. Each relies on the other to succeed. This is done through transparency (government giving to public) and accountability (public giving to government). 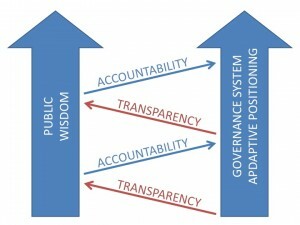 I believe open data plays a big role in the transparency side of the equation, and a useful role in the accountability side, but I’ve recently been struck by the lack of systemic adaptability in our governance systems. In short, why are 15 people making all the decisions for the City of Calgary when we know public wisdom itself contains much more useful decision making information. One multiple choice question every four years hardly seems like the kind of thing our bravest citizens should be asked to give their lives to protect. Shouldn’t there be more? What of the really good ideas that lay outside the institutional input model? The good ideas that model is not designed to – and therefore unable to – reach? Do we just give up on those? Do we just call our current system ‘good enough’? I’ve recently re-discovered Clay Shirky. I’ve been familiar with his work for several years but I’ve always classified them within the box of mind as applying to ‘technology’. Which is fair given that most of his examples lay in this field (Wikipedia, Flickr, Linux, Meetup, etc). But recently I was afforded the opportunity to apply his theories and teachings to the world of governance systems and I was surprised that what he was talking about almost seamlessly fit this world. I’m just a regular guy. I have no power; no input. And I certainly cannot change the 150-year-old institution of Canadian democracy. So I relished the opportunity to do what I and many others witnessing a travesty that I am unable to change would do: I whined about it. Fortunately, I recently read the book “Mistakes Were Made (but not by me), Why We Justify Foolish Beliefs, Bad Decisions, and Hurtful Acts” and was reminded of the quote by Ken Low, “despair is not an option”. I could blame others and wallow, or I could look within myself and see what I could change. I am not the mayor, premier or prime minister, so tackling one of those institutions is ludicrous. But I am the president of another governance system: my community association. Upon quick inspection of that organization I found we – despite having an active membership, being well respected by the community, and being in excellent financial shape – exhibited the same things I wanted to rail against. We had a board of 14 elected officials who were charged with doing all the work of the association. But who cares what we thought most needs doing? We’re just 14 people who happened to have some time or caring to sit on a board. That doesn’t make us any smarter or more capable than any other group of 14 people from the community. It just means we were willing to make the commitment. But how did we make our decisions? Where did our information come from? How did we ensure the really good ideas that lay outside our institutional model were invited in? The answer is: we didn’t. We did what almost every government does; we made decisions based on the best information available. We went with our gut and our experience; we talked to our neighbours, did the odd bit of research, and made decisions at a boardroom table. All of this put the onus on the 14 people and never once invited the public to be part of the decision making process (aside from that one annual vote or having the ability to complain). We also never invited them to be part of the implementation process either. So how could we engage our community to get the best ideas out of them? And do so in a format that is not just a ‘town hall’ style event featuring general discussions, Q & A sessions, and the same 14 people responsible for implementing things at the end of the day anyway? To do this, the Winston Heights-Mountview Community Association partnered with CivicCamp to create “CivicCamp in a Box”. A sort of ‘kit’ that anyone can use, which asks members of the community to come forward and say what they believe most needs doing in the community. It does not end here however. If we are truly going to invite them into the decision making process, we also have to involve them heavily in the implementation process. After all a small army of people working only on the specific project that interests them the most, affords much more possibility for getting ‘stuff’ done than a group of 14 board members working on things they may only be casually interested in. Take for instance what I mention in my 2009/10 presidents report on how things often work at a community association: You as an interested community member want to plan a Stampede BBQ (for example) and you come to the board and tell us you want to plan a Stampede BBQ. More often than not, because you are a warm body who is interested, the community association will promptly make you a board director. The problem is now the majority of the work you will do has nothing to do with planning a Stampede BBQ. This has been a major focus of my time on the Winston Heights-Mountview board, lowering the bar of involvement and eliminating these kinds of barriers. You want to plan a Stampede BBQ? We’ll let you do that. Do you want to join a board? It is our responsibility to provide that opportunity too. Government should be about empowering the people, not getting in there way. And so that is the second half of “CivicCamp in a Box”. Once participants have listed the ideas they have to make the neighbourhood a better place, they will each be given the chance to select one idea that they ‘think most needs doing’ from their perspective and to work on making that idea a reality. We will provide whatever resources we can to help them – starting from lunch and coffee at the event, through to any funds the association might be able to give to their project, to our contacts with neighbours, local businesses and all three levels of government. I’m confident the ideas coming out of this event being held tomorrow will be better and more robustly thought out than anything our dedicated and whip smart board of 14 people could have done on their own. It will even have the added benefit of creating more engaged residents who will be illustrating their commitment to a better neighbourhood, which of course comes with many unintended side benefits from Block Watches to cleaner streets to more friendly ‘over the fence’ conversations. I’m excited about this event even though I’m not sure what any of the outcomes might be, but I’m willing to take a risk and see if it will work. Cherie McCauley and Sarah Arthurs – who I’ve been working with on the logistics of creating “CivicCamp in a Box” – and I have floated the concept to other community associations and many are interested in how this might be used in their neighbourhood. But why stop there? If this process works, why could we not see the Province or the City apply this kind of citizen engagement to, for example, budget deliberations? When an alderman says something is what their constituents want, what process did they go through to ensure it’s not just what they think and that had received little negative criticism? A process like this can eliminate their unintentional bias created by an institutional decision making model. Heck you could go the other way with it too and use it at the local elementary school, senior’s centre or baseball team. The possibilities are endless, really. And I believe by taking our time to do public engagement in a way like this (let’s not kid ourselves, this will slow down the current institutional decision making process) we can see added benefit of increased caring and decreased expenses. Someone just needs to be willing to try it to see if it works. So, I’m happy to volunteer to take the risk. I’ll let you know how it goes.